Sixty-eight social housing flats in Kensington, London, are to be made available to survivors of the Grenfell Tower fire, the government has said. The one, two and three-bedroom flats are located in two blocks that stand alongside a large luxury development, where private homes go for up to 8.5m. 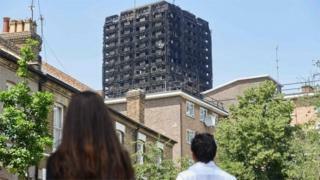 At least 79 people died and many more were left homeless after fire engulfed the North Kensington tower a week ago. 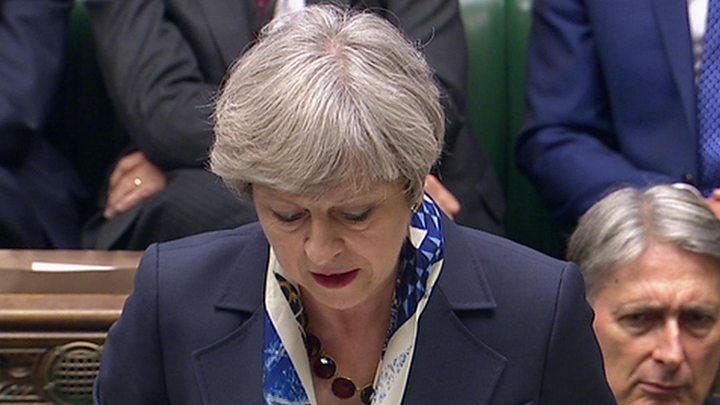 PM Theresa May has apologised for “State” failures after the blaze. “People were left without belongings, without roofs over their heads, without even basic information about what had happened, what they should do and where they could seek help,” she told MPs in the Commons. “That was a failure of the State – local and national – to help people when they needed it most. There has been widespread anger from Grenfell Tower residents at the slow and chaotic response from authorities after last Wednesday’s devastating blaze. On Wednesday, protesters demanding “justice for Grenfell” marched with anti-government protesters through London. 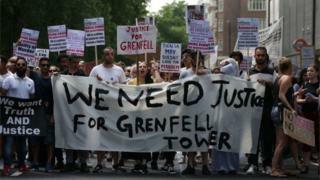 But Justice4Grenfell, a group which supports Grenfell residents, stressed it had not organised any of the events and urged protesters to have the victims and bereaved “foremost in their minds”. A spokesman for the ClementJames Centre, another support group, accused protesters of hijacking residents’ grief for political purposes. 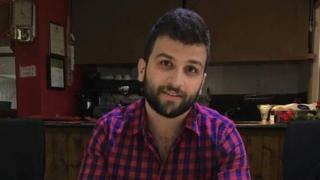 Meanwhile, the funeral of 23-year-old Syrian refugee Mohammed Alhajali, who was among the first victims of the fire to be named, has taken place. His family, who arrived from war-torn Syria, and Mayor of London Sadiq Khan attended the ceremony, called a Janazat, at an east London mosque. His family said: “His very last words to us were how much he missed us. Nestled off Kensington High Street, and a short distance from Westfield shopping centre, Kensington Row is the perfect example of London’s booming real estate market. It’s 700 a week to rent a one-bedroom flat – for that price you get to live in the same borough as Prince William and Simon Cowell. Builders are beavering away to finish the new blocks for the incoming residents, whilst placards that surround the site promise you can “find yourself in the clouds” after you move in. 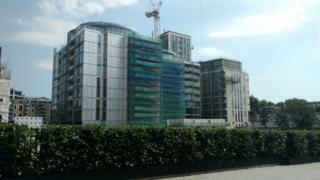 You get a true feel for the development from the flats already completed. On the hottest day of the year so far, the sun reflects off balconies and glass panels onto the tree-lined street and busy main road. The flats all have the luxury finish you would expect of this area – but of course the social housing blocks won’t have the same trimmings. George, a Kensington resident for 30 years, said his new neighbours would be welcome. Since the fire, some Grenfell Tower families have been staying in hotels and B&Bs, and there were concerns that more permanent housing would be offered in other parts of the country. But Kensington Row complex is just over 1.5 miles from Grenfell Tower. It includes a 24-hour concierge service and a private cinema, the website of developer St Edward says, but it is thought unlikely the new tenants from Grenfell will have access to such facilities. Each new home in the two blocks set aside for social housing will be fully furnished and completed to a high-specification, the government said. 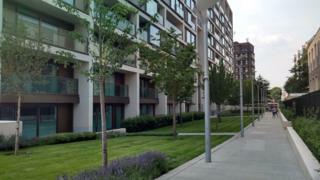 The flats are expected to be ready by the end of July. Yvette Williams, from Justice4Grenfell, said the promise of new flats was a good thing if it gave residents a permanent home but it had come “very late”. A small number of Grenfell residents were still sleeping in rest centres set up in the aftermath of the fire, one week on, she said. The Department for Communities and Local Government said extra public money had been found so the flats could be fitted out more quickly, and more builders had been taken on. It said the “expectation was that these new properties would be offered as one of the options to permanently rehouse residents from Grenfell Tower”. 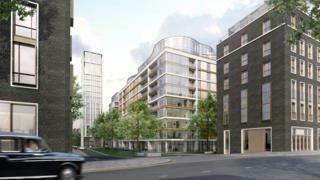 The homes will be bought and managed by the City of London Corporation, and handed over to Kensington and Chelsea Council. Communities Secretary Sajid Javid said Grenfell residents had been through “some of the most harrowing and traumatic experiences imaginable”.